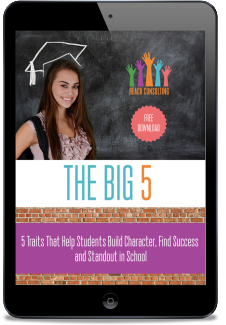 What if your student could maximize their middle and high school experience by doing 5 simple things in order to stand out in school? There are 5 major concepts I teach students, particularly in middle and high school. It’s the concept of the Big 5™. The first step in the Big 5™ is giving back. Developing your philanthropic or servant leadership spirit early will benefit you tremendously. For this step, begin by exploring causes that are important to you. What are you naturally drawn to? What makes you happy if you could give back? Examples include volunteering for a local church, Girl Scouts or Boy Scouts, Habitat for Humanity, a local animal shelter, or the hospital. The opportunities are unlimited. Once you identify the place wherein you want to get involved, do not limit your involvement to just one time during your entire high school career and ignore the remaining years. Do your best to be systematic with your time. For instance, do you have an available 5-7 hours per month to volunteer? If so, contact the leader of the organization to which you want to get involved and see what sort of meaningful volunteer time you can devote with 5-7 hours per month. Be sure to keep good records from the beginning will help you tally your total time spent with the organization. Obtain signatures verifying your time during the season of volunteering which will also prevent you from chasing down people later on to obtain verifications. Tune in for future weeks as we explore the remaining 4 steps of the Big 5™ and to see how Reach Consulting can help you. Sign up for a complimentary consultation to help your family. Take action TODAY!